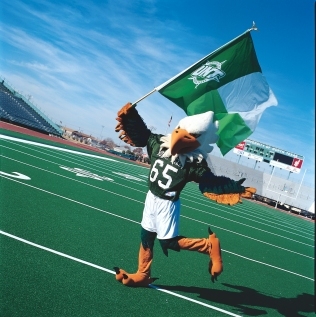 Established in 1890, the University of North Texas staked its flag way down in Denton, Texas. The school changed ownership as well as names a couple of times before settling down. It took until 1913 for a football team to form and to play first in the Lone Star Conference. Just like the name changes, the school also changed conferences. They eventually joined the Sun Belt Conference in 2001 and have enjoyed moderate success since. Because of all of the changes to the school, there is come confustion between the team name and the mascot. 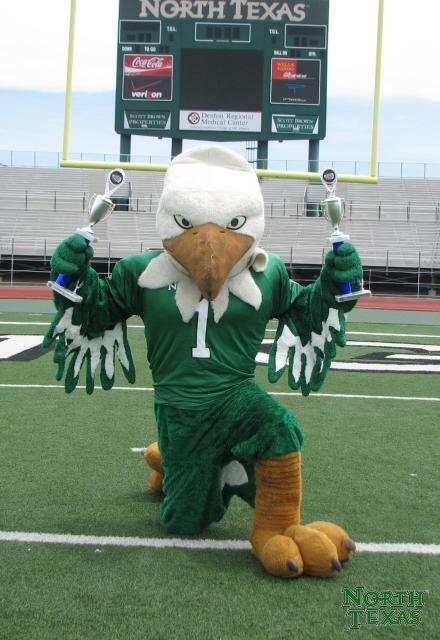 North Texas are the Mean Green but they are also the Eagles. The Mean Green name traces back to a 1967 Dallas Morning News article by Randy Galloway. It was the moniker for the tough rush defense that finished second in the nation. What really helped pushed the name to the top was former alumni and NFL Hall of Famer “Mean” Joe Greene. Fans called in that in the pros but he though it came from his time at North Texas. Regardless, everyone loved it so much, they adopted the name. But what about the Eagles? Way back in 1922, the school grew tired of their “Normal Boys” nickname and decided it was time to come up with a new one. After the votes from the students were counted, the Eagles won out. A costumed mascot did not start out, however. A live mascot, presented as No-Name by Tommy Laney, took the field October 6, 1950. After another contest, the new name was Scrappy. After the live mascot died in 1959, a human mascot bounced around in 1963. There was an attempt to bring back a couple of live mascots in 1967, but after some problems, the human one took dominance. Today the costume mascot name is Scrappy, even though that name has changed multiple time over the years. So let’s take a look at Scrappy. I’m a huge fan of mascots who wear the sport gear of the game they are working. Scrappy is not slouch in that department. He’s got the colors, the pads, and the jersey. 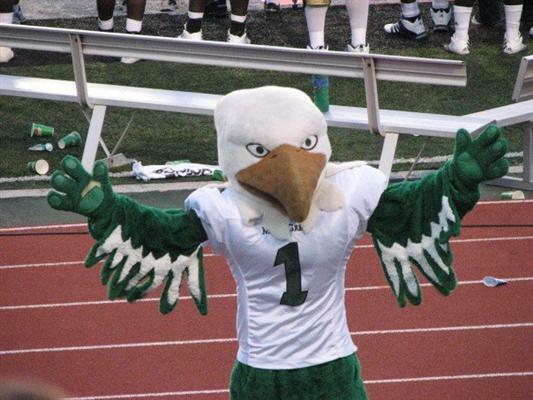 You know, he also kinda looks like the NFL’s Philadelpia Eagle. Hey, that’s quite alright. The wings on the arms of Scrappy are a nice touch. The eagle head looks a little weirt to me, however. It’s almost as if Patrick Stewart is eating a giant Dorito. At any rate, the whole getup is tight. What isn’t tight is the confusion with North Texas. I think they are smoothing things out, but changing names, conferences, mascot names, nicknames, and even live animal to human mascot makes it hard to established a solid tradition. It’s been quiet for the last 10 years so I think they are finally happy. I can understand the change, however. Sometimes opportunity comes and the need for change reveals itself. I’m going through some change myself and will let everyone know about here in a couple of days. It’s very exciting indeed.